As a parent, what’s your worst fear? Well, for me, I have a loooong list. Big scary words come to mind: Cancer. Kidnapping. Accidents. Catastrophe. Sexual abuse. Disease. Illness. Terrorists. Getting run over by a car. Drowning. Forgetting a baby in a hot car. I should add being bullied on that list. And just for kicks, let’s add lice and ticks on that list, too. Just thinking about it makes my stomach churns. But those are just physical things. What about the things we cannot see? As a Christian parent, what’s your worst fear? I’m just going to be honest. One that sits on TOP on MY list is that my kids will doubt God and His love for them. And that they might question God and walk away from their faith. When I think of this, my heart sinks. After all, don’t we try so hard to cultivate our kids’ faith? We take them to church, youth groups, and Sunday school. We do devotions, read Bible stories, and memorize verses. We try to do the “right” things and read the “right” books. But here’s the thing that gets to me every single time. Even then, it’s not foolproof. But sadly it’s not a 100% guarantee. The Book of Proverbs is wisdom literature which is not to be confused with a promise or a covenant from God. We can’t control everything about our lives, and we certainly cannot control everything about our kids either. This old cliche holds true: You can only lead a horse to water but you can’t make him drink it. Ugh, I hate that. Because I like to have control. So being the crazy researcher that I am, I start looking up everything I could about this topic. I talked to friends -- kids, youth, young adults. I started scouring the blogs. I even found blogs of testimonies of young adults and former Christian homeschoolers who completely walked away from faith. And here’s what I found. Many parents respond with fear. They fear their kids’ questions about faith and God. They quickly offer up solutions, give pat answers, or worse, stop these "thoughts" to begin with! In essence, they want to shut-down this type of conversation, rather than prolong it. Many of us want to nip any doubts in the bud before it sprouts bigger. Steve walked out of church that day and never again returned to a Christian church. --Kara E. Powell, The Sticky Faith Guide for Your Family: Over 100 Practical and Tested Ideas to Build Lasting Faith in Kids, Chapter 8, Page 129. You know who the author is writing about? Yep, the Steve Jobs. The very Steve Jobs that is the brain behind the very iPhone, MacBook or iPad you might be reading this post on. Now, this in itself can be a case study. Because Steve Jobs is unique, and his life doesn’t represent all kids that walk away from faith. We cannot extrapolate everything from this case study as universal truths. But we can still learn from it. What if, instead of giving trite answers, the pastor engaged in a deeper dialogue with Steve? What if, instead of giving pat responses, the pastor dug to uncover more of the reasons behind his doubts? What if, instead of giving quick fixes, the pastor sat down and said, “Tell me more”? Instead of FEARING their hard questions, what if we actually engaged with them? 1. When our kids question their faith, they are actually thinking. Questioning is a sign that there is some brain activity towards this subject matter. (I know, eye roll, right?) In a world of digital pacifiers and endless entertainment, YouTube watching, cute cat videos, SnapChatting, video gaming, and endless stream of distractions… it’s hard for these kids these days to sit down and think. Thinking means their brain is engaging with a topic. It’s HARD work. Active thinking means prodding, poking, and turning this topic round and round for examination. Thinking requires that they approach it from different angles and probing it from different perspectives. And how we you know that they are actually thinking? We can tell by their questions. Thinking requires engagement. And that’s not such a bad thing. 2. It helps them develop a stronger case for why they believe what they believe (once they do believe). I encountered this analogy in a Sonlight Homeschool catalog (2012) and it has since stayed with me. Vaccines (whether you love it or hate it) generally works by introducing a tiny bit of pathogen (weakened or dead virus) in a tiny dose. Theoretically, it’s so small that it’s not enough to make you sick. However, this little introduction is enough to allow our bodies categorize it and tag it as an “antigen” (aka, invader). Once tagged, our immune system then works hard to develop specific antibodies (aka, targeted warfare) to fight against it. Next time, when the REAL invaders come, we have antibodies ready to go! And with appropriate ammunition in stock, our bodies can fight these invaders immediately so that we won’t get sick. In the same way, what if these little questions/doubts from our kids serve little doses of vaccines for our kids’ faith for the future? What if we allow them to engage in thoughtful dialogue about hard topics, instead of just telling them what to think? Sure, we still need to teach them truths. But we shouldn’t be afraid when they DO question it. Faith goes against everything we know about how we view life. It takes what we know and turns it upside down and flips it inside out. There’s nothing about faith that is simply nice, convenient, and comfortable. 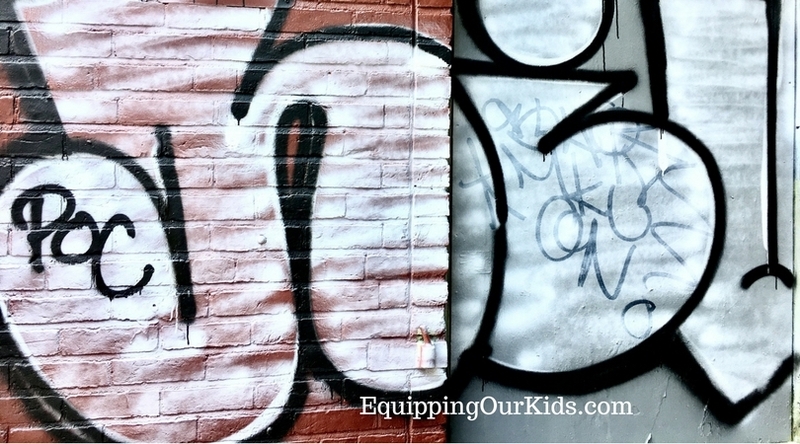 If our kids think that faith is simply a fun youth group event on a weeknight, or a fun outing to attend on Sunday, or a checklist of rules to follow, then maybe they haven’t come to that crossroads yet. But here is the thing. If and when they DO finally catch on and see what it is that God is calling them to live out… their flesh WILL struggle. There WILL be a battle within between the old way and the new way. And maybe, this is when you know that their faith is no longer just a “nice” idea…but is starting to grow deeper roots and taking on a new dimension. Outside of sexual intimacy, no other activity brings two people closer physically than the act of wrestling. What if, in the very act of wrestling with God, our kids are able to come in closer proximity with God, who is their Creator and the Lover of their souls? What if the very act of wrestling with God, allows our kids to experience God in a way that leaves them forever changed? I often wonder about the meaning and significance in the story of how Jacob wrestled with God (or Angel of God) in Genesis 32:22-32. I don’t think I can ever grasp the significance of this event in the Bible. But one thing I know, Jacob left the wrestling match as a blessed man. Joni Eareckson Tada, a quadriplegic, paralyzed from the shoulders down at a tender age of 17, who also authored 48 books up to date, shared about her struggle with God. She was upset, frustrated, angry, and questioned God during her darkest days and her suffering…. But then someone showed me Psalm 77. And it was the words of that Psalm that God used to really touch my heart. Psalm 77, verses 7 to 9, are like six rapid fire questions aimed at the Lord. Questions filled with hurt and disappointment, because the psalmist cries out, “Will the Lord reject us forever? Will he never show his favor again? Has his unfailing love vanished forever? Has his promise failed for all time? Has God forgotten to be merciful? Has he in anger withheld his compassion? Let that sink in for a moment. What if, by questioning God, our kids can be spurred towards a passionate desire to comprehend him? To question God directly, to speak to Him, to cry out to Him…. maybe it isn’t that different than the lamentations of the Psalmists, or of Job or of Jeremiah the prophet. Because, when we turn our hearts towards Him, even in our despair and agony and pain, it honors Him. And through His unconditional love, His word, and His grace… they might be forever changed by being in His presence because they have just encountered the Living God. So looking back, I do have a deep fear that my kids are going to ask me a question that I cannot answer about God and faith. I have a fear that I won’t do Him justice in my explanations. I have a fear that I won’t do a good job defending Him. So maybe...my deepest fear, then, isn’t that my kids question God. My deepest fear is that I would fail them as a parent, the one who is supposed to nurture their faith. If that’s the case, then perhaps my fears have been misdirected. Perhaps my ultimate fear is actually about ME (self-centered) rather than about God. Because...God? Well, if He is indeed the Creator of the Universe…..He is much bigger than any question that we can hurl at him. He can handle our doubts, fears, and our flailing faith. And he can certainly handle anything our kids might throw His way. So the next time you get asked a hard question, a question you can't seem to answer or even something much bigger than you can grasp... just take a deep breath, pull up a chair, sit down, lean in, and ask your kiddo... "I love that you asked me that. Let's talk. Tell me more." And if we are stumped? It's okay. God's got this. Oooh, that was so good, Lilly! Thanks for the reminder- I definitely want to foster a relationship with my children, friends, neighbors, etc. where they feel free to question God when they run up against hard, awful things in life. He truly is big enough to handle it!!! I loved this post! I loved being reminded that my fears are just masked insecurities about myself, not God. Wonderful words!! Thanks for the sweet reminder of God’s faithfulness to us and His strengthening of us when we ask hard questions. ♥️ Love! !